Now you can reduce wrinkles and fine lines with this revolutionary intensive treatment launched by Farmec SA in February 2012. 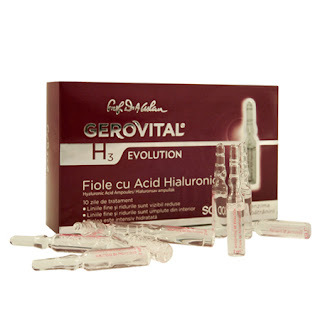 10 days of treatmentThe Gerovital H3 Evolution Hyaluronic Acid Ampules contain a serum rich in Superoxide Dismutase and pure liposome Hyaluronic Acid, with intensely moisturizing effects and a dual action, restoring the skin’s water reserves and reducing transepidermal water loss.The anti-age effect is also enhanced by Superoxide Dismutase which has a protection role both for the collagen and elastin fibers and for the hyaluronic acid. 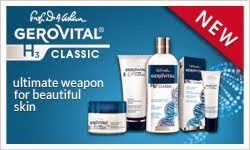 Used regularly, the product visibly reduces deep wrinkles.For long-lasting effects, apply this treatment every month. Pour the ampule content into the palm of your hand and apply on the freshly cleaned skin by gently massaging it. Once the serum is absorbed, apply the daily care cream from the Gerovital H3 Evolution Prof. Dr. Ana Aslan line. Usage: Get the serum entirely at the bottom of the ampule, and then place it with the breaking point forward. For hand protection, wrap the ampule in a tissue before breaking it!